Throughout the years, I was fascinated and amazed by the stories that my grandfather, Mallie Wallace, told about his ancestors. The Wallaces were known to be a rough and tumble crew, spending more time at the County Courthouse for drinking, fighting and so on as they did in church. Isham was always one of his favorite subjects. My grandfather was the grandson of Emsley Wallace and great grandson of Isham. An 1880 article in the Chatham Record depicted Isham and his family, much as my grandfather remembered: "in upper Moore County...an old man named Wallace is over eighty years old, straight as an Indian, six feet high, is capable of doing a good deal of work, has fifteen children living almost in sight of his house, and all of his descendants together amount to about 215 persons. Of the children, six are daughters and nine are sons, and their average height is six feet and their weight two hundred pounds and not one male among the entire family belong to any church." Isham and Nancy had the following children: Clarkey Ann (1820-1891), Elizabeth (1825-1871), Mary Ann (1826-1892), William Wesley (1828-1906), Sarah Ann (1830-1899), Quimby (1832-1895), Dempsey (1833-1839), Lockey (1836-1884), Emsley Thomas (1837-1918), Samuel Bascom (1841-1913), Loveday Jane (1844-1916), Sampson Delaney (1845- bet 1890-1900), Virgil Spinks 'Byrd' (1846-1917) and John M. (1850-1923). Among these children, most resided in close proximately of their parents and raised large families that are still located in upper Moore County. Their children intermarried with the neighboring Cockman, Melton, Hunsucker, Horner and Garner families. The three oldest daughters all married sons of John Cockman and Mary Richardson: Clarkey Ann Wallace married George Cockman, Elizabeth Wallace married J. Sampson Cockman, and Mary Ann Wallace married Noah Emsley Cockman, each Wallace and Cockman union produced at least ten children. William Wesley Wallace married twice and produced fourteen children. He first married Elizabeth Melton and later in life married Margaret Louise Seawell. After Wes' death, Lou moved the family to Greensboro. Sarah Ann Wallace married John Garner and raised a family of eleven. Quimby Wallace married Arabella Stewart and produced nine children. Dempsey Wallace died at the young age of six and is buried at Flint Hill. Lockey Wallace married Susan Muse and raised a family of seven. Emsley Wallace married Priscilla Melton, daughter of James Melton and Temperance Horner and sister to Elizabeth, Temperance, and Candace who married Emsley's brothers. Emsley and Priscilla went on to raise eight children. Samuel Bascom Wallace married Temperance Melton and produced ten children. Sam also married Nancy Smith later in life after Tempy passed away. Loveday Jane Wallace married James Washington Horner, son of George W. Horner and Mary Ann Ritter and raised a family of six. 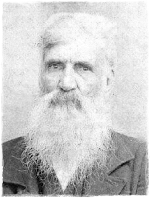 Sampson Delaney Wallace married Missouri Hunsucker and produced eight children. Laney was the only son of Isham to actively fight in the Civil War and became a local deputy sheriff after the war. Upon Laney's death, Missouri moved their family to Rockingham, NC where several of their descendants still reside. Virgil Spinks 'Byrd' Wallace was married twice, and produced a total of eighteen children. Byrd's first marriage was to Regina Hunsucker, daughter of George Hunsucker and Elizabeth Williams and sister to Missouri. Byrd's second marriage was to Flora Ann Garner, daughter of Stedman Garner and Ann Elizabeth Davis. John M. Wallace was married Candace Melton and had one son in NC. John later moved to Perry County, AR where he was elected as a Judge, was married four more times and produced at least 13 more children. State v. Thomas Muse & Daniel Muse, Sr.
Isam Wallace v. Thomas B. Tyson, Admst. of Holden Cox, decd. Archibald Curry v. Jacob Stutts, Admst. Isam Wallace v. Thomas B. Tyson, Admst. Henry Stutts, Sr., by his guardian Robert W. Goldston, sold 150 acres located on Buffalow Creek adjoining Alexander McNeill, Matthew Yow and Isham Wallace. Stutts had been found to be a lunatic or idiot and the real estate needed to be sold for his support and maintenance. *Note: From 1860 to 1882 there are numerous references to Isham Wallace in Moore County, NC records. Given the presence of another Isham Wallace during this time period I will only list the ones that are obviously the Isham in question. "Rev. J.L. Smith, a zealous Baptist missionary in the upper end of Moore County, gave us at the (Sandy Creek Baptist) Association last week, the following interesting points about a most remarkable family living in that section: an old man named Wallace is over eighty years old, straight as an Indian, six feet high, is capable of doing a good deal of work, has fifteen children living almost in sight of his house, and all of his descendants together amount to about 215 persons. Of the children, six are daughters and nine are sons, and their average height is six feet and their weight two hundred pounds and not one male among the entire family belong to any church." "Carthage Gazette: The venerable Isham Wallace leaves behind him a remarkable record which is worthy of mention. He had attained the age of ninety years; and Mr. H. McNeill, Probate Judge - who is closely identified with county history, adn knows the people as thoroughly, as any man in Moore - informs us that Mr. Wallace left four generations, of 275 direct descendants. This is certainly an extraordinary page of family history."